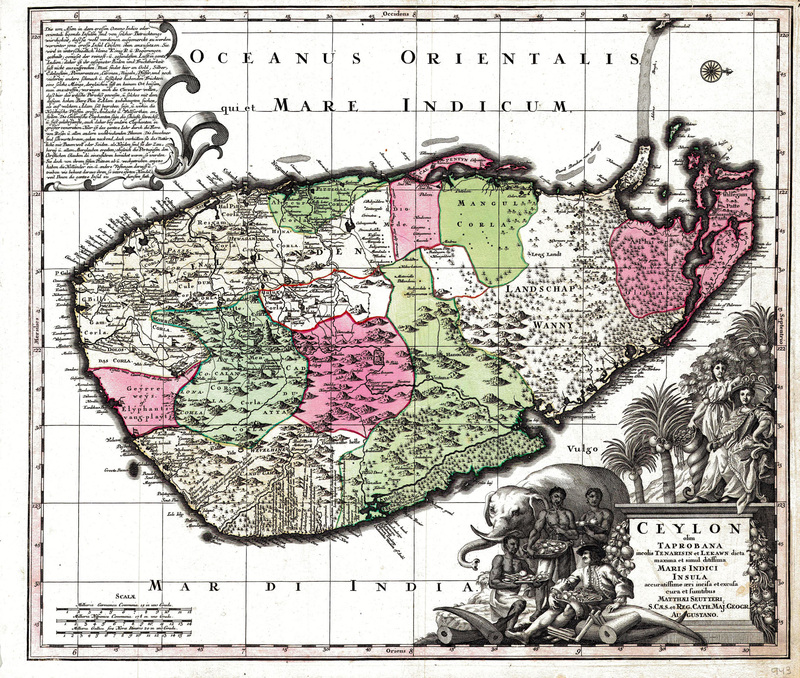 Antique Map Ceylon by Seutter titled ‘Ceylon olim Taprobana incolis Tenarisin et Lekawn dicta maxima et simul ditissima Maris Indici Insula (..)’. Attractive and rare map of Ceylon, with an elaborate decorative title cartouche. This decorative map locates early forts, temples, mountains, and Dutch sea ports. One of the most detailed and decorative maps of Ceylon published in the period. Published in 1730 in Germany by Georg Matthäus Seutter (also Matthias Seutter; 1678-1757) , one of the most important and prolific German map publishers of the 18th century. Measures: 571 x 482 mm.